Retention cohorts are a tool used for analyzing your user data. This allows you to pinpoint why your loyal users stay by comparing similar groups of users (AKA cohorts) who continue to use your app. This data is based on live-user behavior and helps you design more effective engagement campaigns. 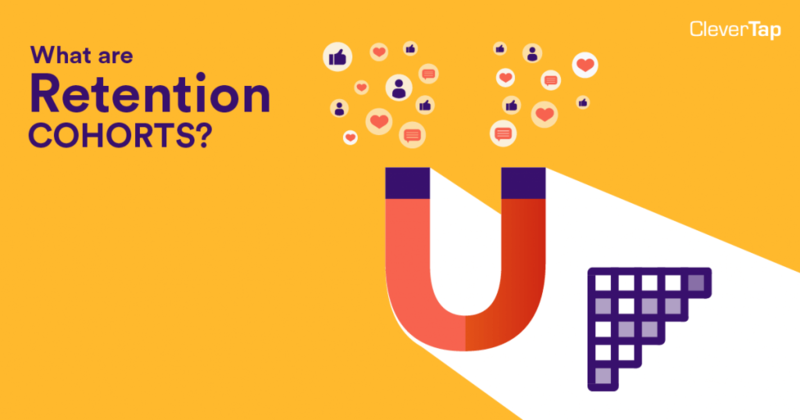 Retention cohorts identify how well you are retaining your loyal users, and more importantly, what factors drive this loyalty. Like other cohort analysis tools, retention cohorts help you understand why users drop engagement or churn. With this insight, you can fix what’s wrong in the user experience and retain more customers than you lose. Retention cohorts looks at groups of users who keep using your app. They are observed over time, to monitor how their behavior changes. Here’s an example: if we send out an email to 100 people, some may buy the product on day 1, less on day 2, even fewer on day 3, and so on. But if we send a second email to 100 people after few weeks, they’ll be buying the product on their “day 0” while the first email might show its prevalent lag effect on the buying decision. In order to track how users behave over time or how the same behavior differs for different cohorts, cohort analysis helps to compare these people by the way/time they were acquired or by the retention of those users over time.